Thankfully, the pipes in your home are hidden from view, so that you don’t have to see them or hear them. But that also means that it can be difficult to tell when there is a water leak in your pipes. Plumbing leaks waste water, damage property, and allow for the growth of mold and mildew, so it’s important to detect leaks as early on as possible. Contact Wimpy’s Plumbing & Air for water leak detection in the Sarasota, FL area, and we’ll help you get water leaks under control. You want to fix a leak as soon as possible in order to prevent costly water damage from accumulating and destroying your budget. But it’s not always simple to tell whether or not your pipes are leaking. 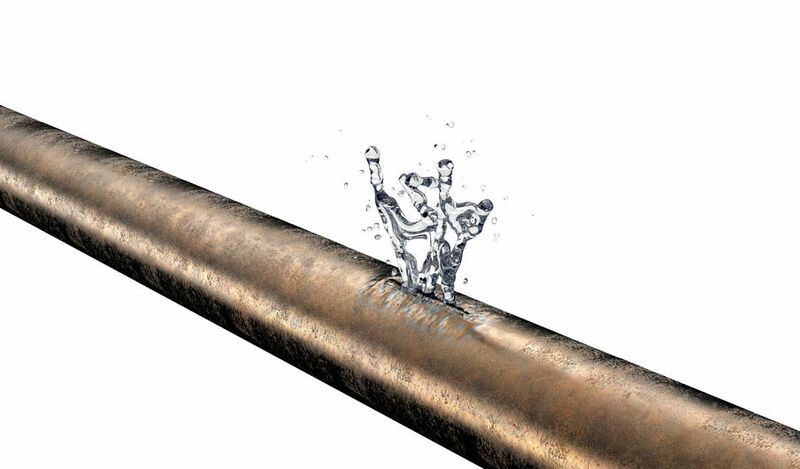 A burst pipe is an obvious problem, but a slow trickle from a pipe continuously wastes water while often escaping detection for days, months, or even years. In order to make sure that you get a chance to call a plumber in Sarasota as soon as possible, we have listed here a few ways you can tell that your pipes may be leaking. Some of the worst plumbing leaks that can occur in a home are those that actually begin underneath the house’s concrete foundation. Slab leaks, which occur in the pipes that run underneath the concrete slab, may go undetected for some time, and can do some major damage, leading to hundreds or thousands of dollars in repairs to the piping and to the foundation of your home. Many plumbers do not have the right tools to detect slab leaks, and your insurance policy likely does not cover leaks that are found too late. While we can often complete repairs once we have successfully pinpointed the source of a water leak in one’s plumbing system, this may not always be the best way to go. Because of the corrosive nature of the water in this area, repiping the section of the system, or the entire system itself, may be a better option to consider. The way we see it, rebuilding the ship makes more sense than constantly plugging up holes. Contact us today, and we’ll happily provide you with a repiping estimate. The most important step in leak detection is calling a professional for the job first and foremost. Having a professional look for leaks as soon as possible means you can repair the problem sooner, minimizing water damage and potentially preventing the development of mold and mildew. When you want professionals you can trust for water leaks in Sarasota, FL, get in touch with Wimpy’s Plumbing & Air. All of our plumbers are highly trained, experienced professionals, so you know the plumber visiting your home is qualified for any job. They can help you decide what to do next to get the problem under control. Call us today, and we will exceed your expectations!